Intellectual property (IP) refers to creations of the mind: inventions, literary and artistic works, symbols, names, images and designs used in commerce. IP plays an important role in an increasingly broad range of areas, ranging from the internet to healthcare to nearly all aspects of science and technology, law, literature and the arts. Understanding the role of intellectual property in these areas - many of them still emerging - often requires significant new research and study. No person or for that matter no business organization is an island unto itself. No business enterprise is capable enough to perform all its activities by itself. It has to depend upon some other entities for some of its functions. Assigning some of its activities by a business to others is by general definition called outsourcing. Companies take a step back, look at what their competencies are and are not, and if they find some are deficient, they contract an outside business whose expertise covers those aspects. With a realization that they can't be all things to all people, service organizations like Intellectual Property practitioners, lawyers, physicians, surgeons, dentists, clinical laboratories, hospitals are relying on service providers to manage critical but non-core processes for them. By doing so they are able to focus more on their core competencies. It is in fact essential for them to do so as these professionals are generally operating with skeleton staff strength and for the sake of profitability are not in a position to maintain large work force. Outsourcing of support functions like search, analysis, proof reading, reminders to the customers, pay roll, drafting and editing of documents, maintaining personal records of customers, research and development (R&D) et al allows them to focus on their core competencies and remain profitable. It won't be wrong to say that in 10-15 years from now, service organizations may be outsourcing all work that is "support" rather than revenue producing to keep themselves afloat. The management needs to look at the business from a strategy perspective. Without these aspects taking up personnel and time, they could focus their capital and energy on other areas. Outsourcing has many benefits, including the fact that the outsourcer's job is to devote its resources to this one aspect of a business, be it financial or legal, etc. In general, this would mean that the service level would be higher. These outsourcers are providing a better service at a much lower cost than the company's costs in performing the function in house. Outsourcing gives these businesses the opportunity to provide much improved quality of service to their customers. Outsource to O2I and benefit from cost-effective services. Outsourcing of intellectual property functions is not a new phenomenon. For many years now, outsourcing of mainly support functions has become a major player in the business game of IP practitioner firms in the US. Despite the anti-outsourcing rhetoric, businesses must remain profitable in today's highly competitive global economic environment particularly when the IP practitioners and other professional service providers are operating on razor thin margins. Those firms that outsource some of their functions into other countries are reaping rewards and meeting the bottom-line goals. In recent months Microsoft Corp. began using Indian professionals to search for prior art - written information about an invention - in preparation for filing patent applications. Other Fortune 500 companies, such as Oracle Corp., have considered it. And law firms, which often follow the lead of their customers on new initiatives, are finally catching on. Outsourcing may be a dirty word for some people for political considerations. But in the real world - where costs and competitiveness matter - Intellectual Property Practitioners, medical practitioners as well as lawyers, like other professionals, have started to recognize the value of tapping into the highly educated, English-speaking Indian workforce to carry out tasks that would typically be performed by junior-level employees. Several outsourcing companies are courting the U.S. legal market, using Indian lawyers, scientists, and other trained professionals in cities like Hyderabad, Bangalore, and Noida. There are a few different emerging models. Vendors like Lexadigm Solutions and Lawwave.com rely exclusively on Indian lawyers to conduct low-level legal work and analysis. Others, like Office Tiger, use a mix of lawyers and trained professionals to handle legal and non-legal tasks such as managing conflicts databases and document management and review. Outsource2india offers a range of technology-driven services which include call center services, data entry services, engineering services, finance and accounting services, creative design, web analytics services, healthcare BPO, photo editing services, software development, research and analysis services and a host of other additional services. Outsource to O2I and concentrate more on your core competencies. Some law firms and legal departments have opened their own offices staffed by Indian employees, rather than outsourcing their work to a third-party vendor. This is called off- shoring. In 2001 General Electric Co. established a legal team in Gurgaon, India, with lawyers and paralegals who draft documents like contracts. Several hundred Indian employees - both lawyers and others - scan, code, index, and abstract documents. Bickel & Brewer's offshore practice has been so successful, says partner William Brewer, that the firm spun it off as a standalone company. While cost might be the most obvious incentive for outsourcing all types of Intellectual Property work to India, a number of other motivating factors are cited. One is the 9-to-13-hour time difference between the United States and India, which gives U.S. major the sense of operating on a 24-hour-basis. "When I go home at six I can have them do the grunt work, research, and proofreading that I would otherwise have other people do," says Solan Schwab, a New York-based solo practitioner who out sources research projects like analyzing state-by-state insurance regulations with QuisLex, which has 12 lawyers in Hyderabad. "Then when I come to office in the morning, I receive a beautiful e-mail with research done exactly how I like it." Schwab sees outsourcing as the answer to the age-old dilemma facing solo practitioners: an erratic work flow that doesn't justify the overhead of a full-time staff. He estimates that by outsourcing legal work, he spends about one-third to one-half of what he would spend on hiring a full-time associate. IP Practitioners say that the financial incentive of outsourcing work is the factor that most impresses their customers. "None of my customers has opposed this because it saves them money," says Noah Henry Simpson, of Simpson, Woolley, McConachie of Dallas. "It probably saves them at least half of what they would usually pay." One would realize that outsourcing work to India is no different from outsourcing scanning and coding of litigation documents to a vendor or legal work to a temporary lawyer in your own country. Where to outsource? India, of course! Intel, IBM, Cisco, Yahoo, Amazon and Oracle find it works! Outsource to India for technological agility, quality, flexibility, cost control, time-to-market and competitive advantage. India is an important location and it is the only one in the developing world. Outsource to O2I and leverage the advantages that India offers. India exports software to 95 countries around the globe and has expertise in global methodologies. India enjoys the confidence of global corporations. 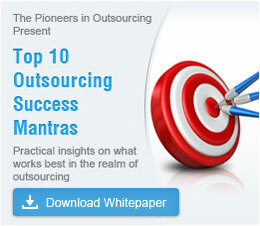 82% of the US companies ranked India as their first choice for software outsourcing. Bill Gates says that India is an IT superpower. His Microsoft has struck strategic alliances with WIPRO and Infosys to develop applications on the .Net platform. Jack Welch has opened a $130 million Technology Center in Bangalore. GE's largest R&D center outside the US has celebrated 10 years of GE Medical Systems in India. India has state-of-the-art technologies for total solutions. Offshore assignments have moved up the value chain - from data entry to large and complex turnkey projects. The IT Act passed in 2000 brings e-commerce within the purview of law and provides for stringent punishments to "cyber criminals". With this, India has joined a select band of 12 nations that have cyber laws. Software Technology Parks of India offer world-class infrastructure and various incentives and concessions to encourage foreign investment and promote software development in India e.g. 100% foreign equity is permitted and approved under the Automatic Route with tax holiday until 2010. To top it, India has effectively provided efficient software solutions to Fortune 500 companies and there are many global corporations which are relying on software companies in India like Citibank, Morgan Stanley, Reebok, General Motors, Sony, Coca-Cola, Pepsi, Swissair, United Airlines, Philips et al. It is not surprising that corporate giants in western countries like United States and Europe are increasingly looking to India for cost-effective and high-quality support solutions. In fact, a World Bank-funded study in the United States confirmed that vendors rated India as their number one choice for outsourcing. India has invested heavily in education and can provide a ready supply of bright people in all fields at a relatively low cost. A strong supply of high-quality talent, favorable government and tax incentives, and the ability to complement U.S. time zones with a virtual around-the-clock approach are some of the advantages India has to offer. Outsource to O2I and increase your business value. Our specialized and skilled services can help you achieve maximum profit. Outsource to O2I and give your organization a competitive advantage!